This is available as a pay-what-you-wish download at Bandcamp (I encourage you to grab it for free, any funds collected will be donated to charity). Click the blue “Buy Digital Album” above; put in whatever amount you’d like to “buy” the download, “zero” is always an option. From Sam: 20 years ago, I created this cat-themed compilation to inform people about the deadly disease FeLV, and let everyone know that the safest cat is an inside only cat! Over the years, I’ve donated $10,000+ to the album’s charity, The Tree House Humane Society in Chicago — first as royalties, and when CD sales dwindled I just kept donating. We were talking about this album recently on Facebook; I thought it would be lovely to bring it back for all the cat lovers (and music lovers, too.) I got in touch with all the artists and received their OK to make this available digitally. The download is name-your-price; I have around 60 CDs remaining and they’re $5 while supplies last. All money raised (after the fees charged by Bandcamp) will be donated to a local Portland cat charity (I’m looking at a couple, might split the donation between them). Includes a digital booklet with all the info from the original 12-page insert (Kitty pictures, artist credits and details about Feline Leukemia). After suffering the loss of his only cat to feline leukemia, Projekt (and black tape for a blue girl) founder Sam Rosenthal was moved to create a disc that would prevent others from suffering this same grief, while also supporting a local Chicago kitty cause. Enlisting the aid of ethereal, gothic, shoegazer and darkwave artists who share a common love for cats, Projekt presents this unique compilation. Each band contributed a song about their own cat and donated their full artist royalties to a Chicago-based charity, The Tree House, a “no-kill” cat shelter; the booklet contains information on avoiding the spread of feline leukemia and preventing your cat from this horrid fate. In the early 2000s, a fan name Amanda wrote and asked: “I was very happy to get my Projekt order so quickly in the mail, and I’ve really been enjoying all of the music. 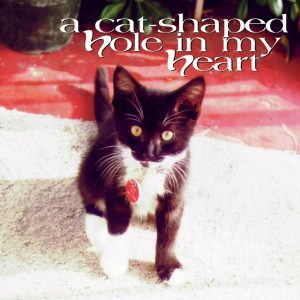 One of the CDs I bought was A Cat-Shaped Hole In My Heart and it’s a great album. But when I took the CD out of the case, I noticed that the back liner had a Kodak photograph of a cat slipped into it. I was just curious…is the photo just a random cat, or someone’s pet? Is that Vidna? It struck me as odd because the rest of the liner is just regular paperboard, but this is an actual printed photograph on glossy Kodak paper. If you have a minute, please let me know! Thanks again. hello, amanda! i am glad you are happy with projekt and our music. as far as the cat cd goes, when we were planning the cd, we asked people on the projektlist to send us pictures of their cats to include in the cat cds. we received hundreds of photos and we put one in each of the cds we sell mail order…the cat must indeed be someone’s pet…some people included their cat’s name on the back of the photo, or a short story about their feline friend. perhaps you would like to take yours out of the jewel box and see if there is any info on the back… take care and thanks for supporting the kitties!